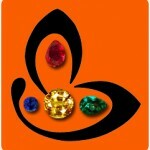 Table of Natural Yellow Sapphire and Natural Red Coral Gemstone Facts! Comments Using two smaller gems and reached the desired weight has become very popular for those who want to implement Gem therapy in the correct manner and who have understood the correct interpretation of the Gem Pyramid! Look at this unique and fantastic implementation! 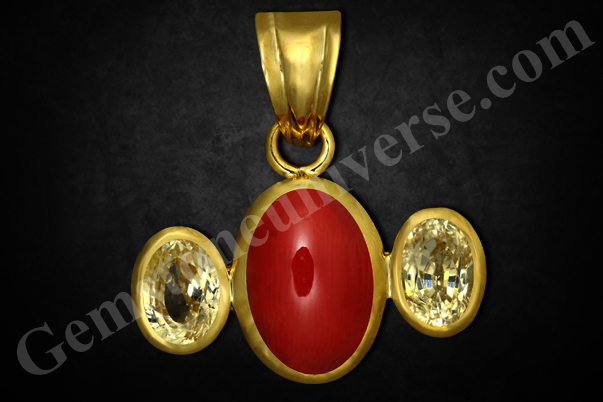 Two eye clean, lustrous and Light golden yellow colored fully natural and untreated Ceylon Yellow Sapphires together of 3.16 carats set besides the Organic Red coral in a 22K Gold pendant and making a potent and Sattvik talisman full of Jyotish powers! Super smooth and super shiny surface and the ravishing Mediterranean Ox blood red color in this Natural and Organic Red Coral! Set with the two Sapphires on its sides in a 22K Gold pendant, looking all geared up and ready to bless the wearer with the most potent and Sattvik energies and Mars gifts!